Saturday's march is expected to be smaller than the previous women's marches to protest Donald Trump's presidency. The event has been marred by accusations of anti-Semitism and homophobia against some organizers. Thousands of women across the country are expected Saturday to join the third annual Women's March against the Donald Trump presidency, but this year's installment has been marred by accusations of anti-Semitism and homophobia against some organizers. The march, to be held in cities and towns across the United States, is expected to be smaller this year than its debut Jan. 21, 2017, the day after Trump’s inauguration, according to Shandra Woworuntu, a board member of the Women’s March Alliance, which established the original event. Millions attended across the country that day, according to organizers and an analysis by The Washington Post. “Every year since, it’s been a little smaller, but we always hope that the spirit of this march will live forever in our heart,” Woworuntu said Thursday. 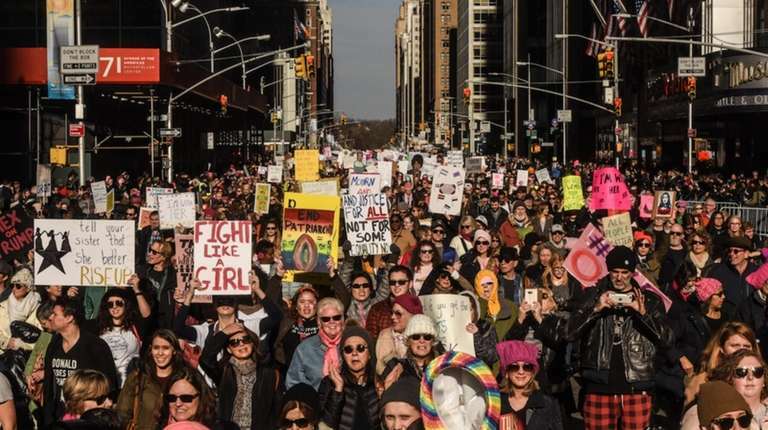 In New York City, organizers are asking participants to line up at 10 a.m. in Manhattan, with entry either at 72nd and Columbus Avenue or 72nd and Central Park, according to the alliance webpage. Around the same time, a separate march is planned "to highlight the leadership of black women, immigrant women and women of color," according to the Facebook page of Women's Unity Rally, another group. That event will be at Foley Square in lower Manhattan. In Washington D.C., home of the flagship march, the event is relocating from the sprawling National Mall to the smaller Freedom Plaza, on Pennsylvania Avenue, past the Trump International Hotel, according to a written statement from the organizers. The Democratic National Committee and the Southern Poverty Law Center, a nonprofit focused on studying hate groups, are among the groups that have pulled out of sponsoring the event over the controversy. The accusations of anti-Semitic views among organizers began before the first march, when black and Hispanic organizers reportedly repeated to a Jewish colleague who has since left the group a false claim that Jews played a major role in the American slave trade. In addition, one of the march founders, Tamika Mallory, has referred to the Rev. Louis Farrakhan of the Nation of Islam as the “greatest of all time.” Farrakhan has been denounced by groups including the Southern Poverty Law Center for making remarks they have termed anti-Semitic. Earlier this week, on “The View” TV show, Mallory said she didn't agree with some of Farrakhan’s statements, such as likening Jews to termites, but she declined to condemn Farrakhan. Mallory could not be reached for comment Thursday. Woworuntu said she expected thousands if not more to attend the New York march. Sister marches are planned across the country, including one on Long Island at the so-called Resistance Corner, 3141 Nesconset Hwy. in Port Jefferson Station, from 2 to 4:30 p.m. according to an organizer’s Facebook page. The organizer of the Island march did not return a message seeking comment. The "Resistance Corner" has also hosted rallies such as "KavaNO — #CancelKavanaugh" and a pro-labor May Day event. Among the march's participants is Long Island Rising, whose Facebook page urges support for gun control, LGBTQ rights, addressing climate change and immigration rights. The group is asking participants to bring along hygiene products to donate to local domestic-violence shelters, including tampons, maxi pads, diapers and wipes. Rabbi Ammiel Hirsch, senior rabbi of Stephen Wise Free Synagogue in Manhattan, disavowed the march even though he said he agrees with the political aims. Earlier this week, nine rabbis, including Sharon Kleinbaum, signed a letter that endorsed the march after meeting with organizers, according to an account in The Forward, while four others in the group declined to sign.